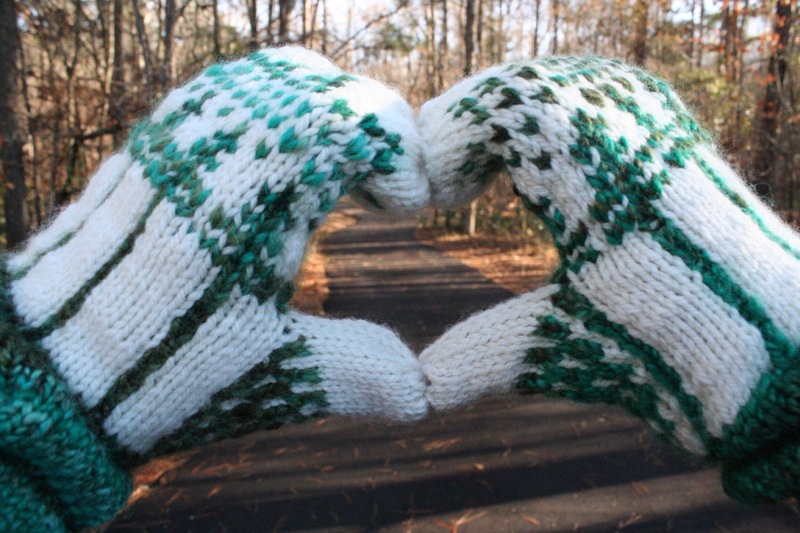 Scrolling through my Instagram feed in early November, a pair of handknit mittens caught my eye. 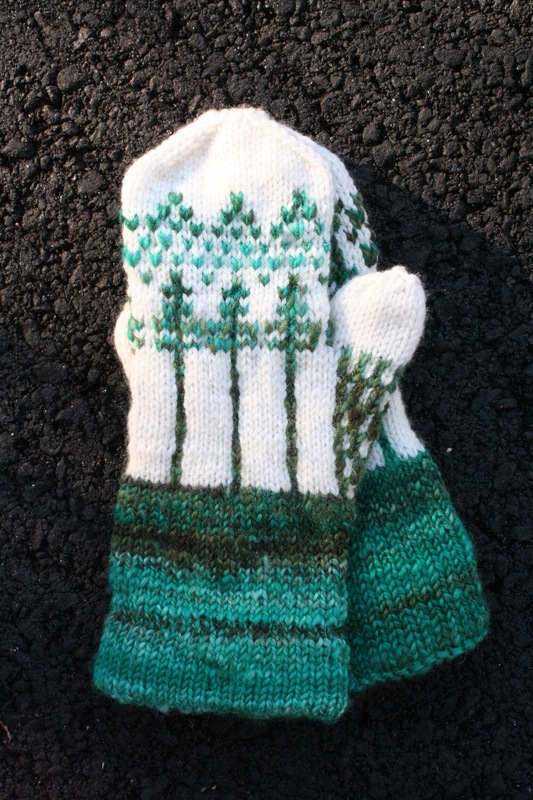 They were colorwork mittens, with a contrast hem, and a tree motif – swoon – designed and knit by the inimitable Kirsten Kapur. I was totally captivated and immediately obsessed. 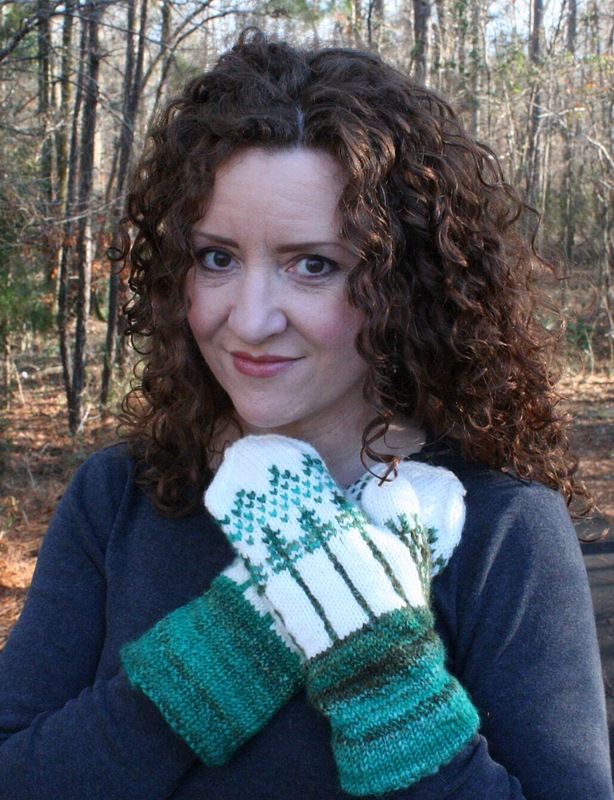 Turned out, it was a soon-to-be-released design, and Kirsten was looking for test knitters. I was thrilled to get to test this pattern. 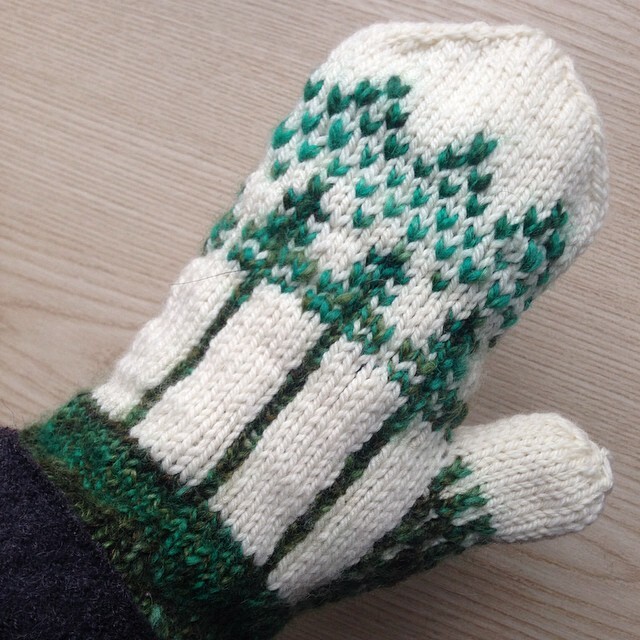 I had some green handspun in my stash (I believe I spun it up three, maybe four, years ago) that was just begging to become trees in this mitten pattern. And who am I to stand in the way of yarn fulfilling its destiny? This was a truly delightful knit, from beginning to end. Watching the trees grow out of the cuff, especially in the subtle shades of this handspun, was nothing but joy. I also learned how to be more mindful with my colorwork. I had tension issues early on, which resulted in my having to knit back an entire half mitten and try again. These beauties were worth it. The pattern is well-written, clear, and easy to follow, as is always the case with Kirsten’s patterns. If you are new to colorwork, this would be a perfect first colorwork design for you to try. The end result is totally cozy and completely charming. The contrast hem inside the cuff is a sweet little detail (I didn’t manage to get good pictures of mine, but it’s done in a rich brown). (The non-handspun yarns I used for the white background and the brown hem were both Stonehedge Fiber Mills Shepherd’s Worsted – have I mentioned it’s made in Michigan?). But I do have one problem. 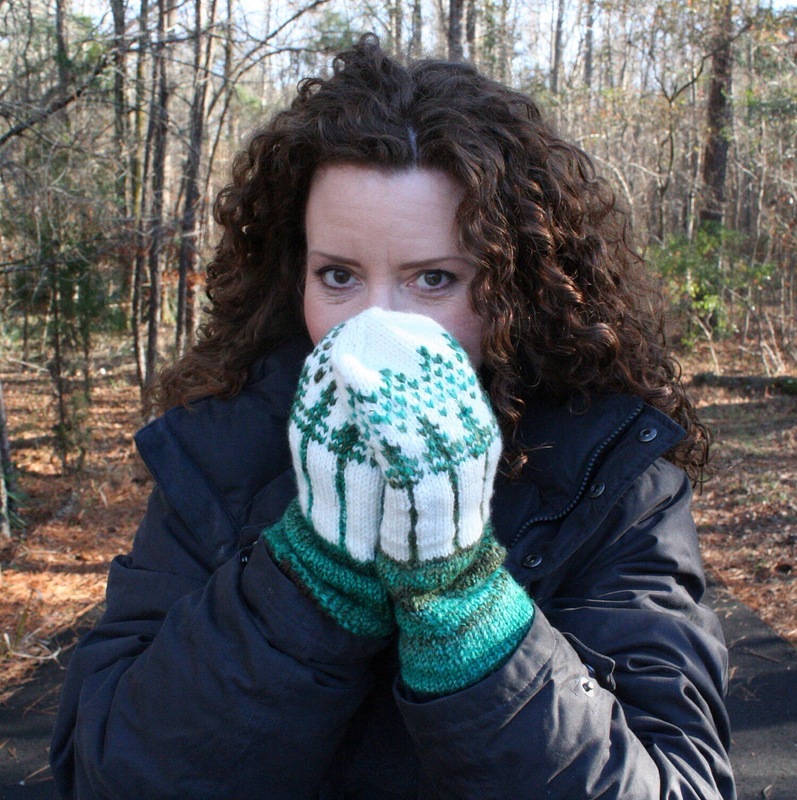 I love these mittens so much that I haven’t been able to bring myself to actually wear them. They are just too precious and I’m afraid of ruining them! But mittens are made to be worn, so I will wear them, I promise, once I get done admiring them. Thanks, Kirsten, for another perfect pattern! The rest of you need to knit these. You won’t be sorry! You can get your own copy of the pattern here. If you have enough green left you could do the same pattern in reverse colors. Then you’d have green instead of white at the fingertips where it’s more likely to get dirty. Love, love, love. Thank you so much for the kind words! I adore your handspun Metasequoias. I really love your mittens. I especially love the colors. Very nice work! Oh, I feel the same way for some knits. 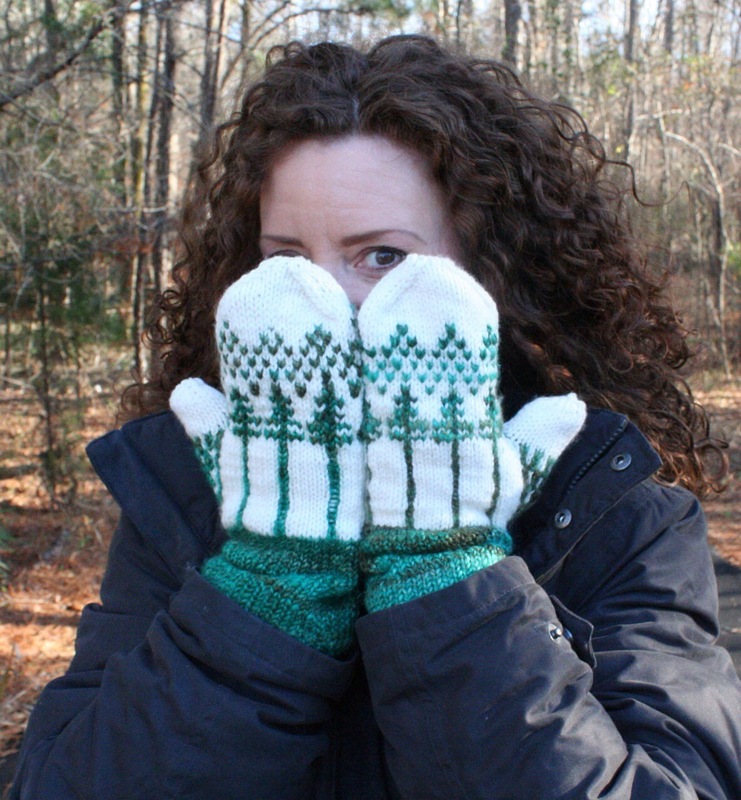 I finally pulled out my Woodruff mittens this winter to wear and they are so warm. It puts a smiles on my face to see them on when the weather is so gloomy outside. Beautiful mittens you have!